Noise from industrial activities can disturb sea life throughout the world’s oceans, but the problem may be especially acute in the Arctic. Unnatural noise, such as airguns, ship engines, pile drivers and sonar pings, can damage a marine animal’s hearing, mask underwater communication and disrupt critical activities, including migration. The cacophony is compounded in the Arctic by weather noise that was once dampened by the ice blanketing the ocean. “The melting ice opens everything up for more shipping, more oil and gas exploration. At the same time, because of climate change, the storms are getting worse, and so you’ve got more wind and wave noise,” said Lindy Weilgart, a bioacoustics researcher at Dalhousie University in Halifax, Nova Scotia, who studies whale sounds and communication. Recordings on acoustic monitors showed that when the airgun sounds first rose above background noise levels, bowhead calling rates quickly doubled. But as the whales’ cumulative noise exposure built up and surpassed a specific threshold, they became silent until the airguns stopped or moved away. These behavioral changes were triggered by “a surprisingly low level” of sound – far less than the noise from a ship engine at the same distance, lead author Susanna Blackwell, a senior scientist at the bioacoustics research group Greeneridge Sciences, wrote in an email. Another scientific analysis suggests that industrial noise may sometimes be indirectly lethal to marine mammals. 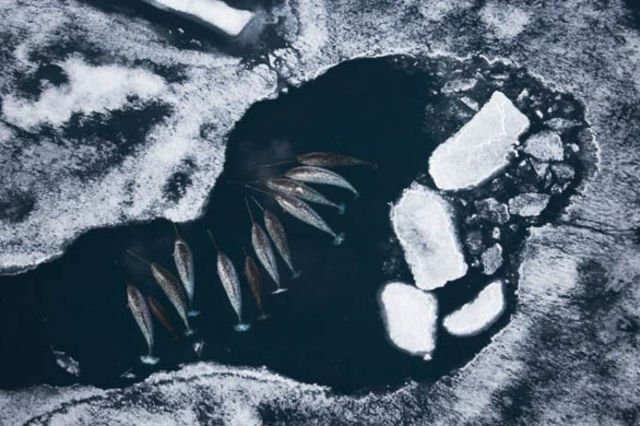 More than 1,000 narwhals became trapped by ice and died in northern Baffin Bay between West Greenland and eastern Canada in 2008 because they didn’t migrate to their winter grounds at the usual time. Scientists saw it happen again – though with a smaller number – twice during the 2009–2010 winter. Seismic surveys taking place near the narwhals’ route south through Baffin Bay in all three years may have prevented them from migrating in time to avoid freeze-up, the authors explained. The effects of noise are also being noticed in Arctic indigenous communities. There, decades of observation suggest marine mammals are changing their behavior in response to new sounds. 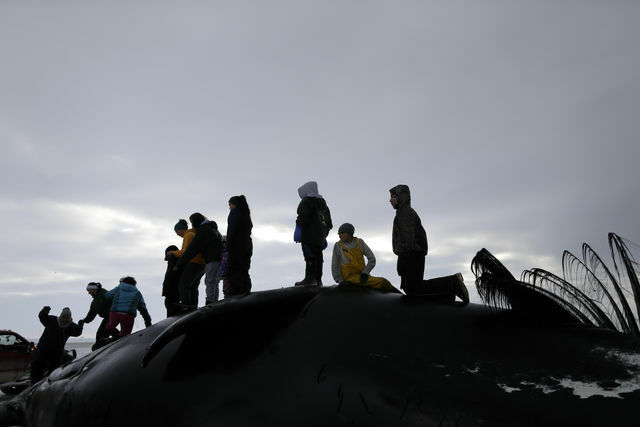 In a series of listening sessions, held around Alaska by the Marine Mammal Commission earlier this month, Inuit hunters voiced concerns that a rise in shipping was stressing whales and seals. And in a 2014 report by the Inuit Circumpolar Council, Inuit throughout the Arctic said seismic surveys were driving animals away from their hunting grounds. Traditional knowledge must be incorporated into efforts to address Arctic development and noise, scientists and policymakers say. “It took us 30 years to prove they were right,” said Clark. Can Arctic Development and Marine Mammals coexist? The sounds that appear to disrupt Arctic sea animals’ behavior are below current noise standards for industrial activities, studies such as Blackwell’s show. Most of the existing patchwork of guidelines, such as the U.S. Marine Mammal Protection Act and environmental impact assessments for individual projects, fail to take into account the cumulative, additive and chronic effects of underwater sound, said Clark. He and other scientists are calling for new, international protections for marine mammals based on aggregated sound exposures from all sources. One novel idea is to establish “acoustic sanctuaries” for marine mammals. The concept is similar to that of marine protected areas, zones where some activities, but not all, are prohibited in an effort to shelter marine species from harm. A recent paper identified several areas off the coast of British Columbia that are frequented by large numbers of whales but have little shipping or other man-made noise. The authors suggested sites like these in the Arctic could be designated as underwater sound refuges with minimal effect on industry. Finding a noise level that suits both Arctic development and marine mammals will be challenging, said Weilgart. She believes the immediate solution lies in better engineering, and has been working on noise-reducing measures, such as lowering ship speeds, with the shipping industry. “There’s all sorts of neat stuff they can do,” Weilgart said. Some of the region’s noise is already starting to die down. Falling oil prices have reduced the number of airgun surveys off the coast of Alaska as petroleum companies put their drilling plans on hold. Cheryl Katz is an independent science writer covering climate change,_ energy, technology and environmental health. She has a special interest in the cryosphere, and has traveled to both the Arctic and Antarctica. Her articles have appeared in National Geographic, Yale Environment 360 and _Scientific American, among other publications.